Stop mob spawning on trees! 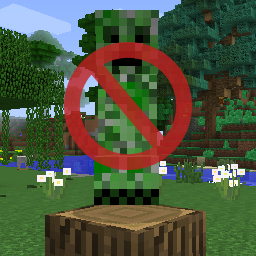 Creepers will no more fall on your head! Especially useful if you have some mods which can generate big trees, such as Realistic Terrain Generation, Thaumcraft, ExtraBiomesXL, etc. Disable mob spawning on woodlogs (default). Disable mob spawning on mushroom blocks (default). All of the above are setting in a single and neat config file. See wiki for details. Add/Override entries of mob spawning list. Adjust the spawning capacity of mobs. Increase overall spawning rate (number of spawning tries in a tick) of mobs. You are welcome to include this mod in modpacks as long as you provide credit by linking back to this page. Better Auto Jump: Auto-jump when holding Sprint key. Light Level Overlay Reloaded: Visualizes the light level on top of blocks. Unicode Font Fixer: Fixes broken text caused by small Unicode font. I haven't been able to find any examples of a working up to date modded mob spawning config to work off of for figuring this out so I'm kind of stuck. If you can tell me what I'm doing wrong or if I've misunderstood something I'd be very appreciative. Mods been working great for all my vanilla mobs, you did some great work on this one. does this mod make ghasts appear in desert and make savannah harder? No, it's a config mod. If you don't edit the configs it will simply stop mobs spawning on trees and mushroom blocks. There is a simple preset that you can use to do that if you wish however. Is this the correct syntax for adding spawning for mod added mobs? Is there a way to exclude mobs spawning from mob spawner blocks? Whether it be from vanilla spawners or modded spawners? Any way to prevent mob spawning withing the radius of any village? Is it possible to remove animals spawning? Does this mod function if it is only installed server-side? Hello! I'm wondering if your mod can triple the amount of monster spawns in any given area, at any given time. Say if one zombie were set to spawn, it would spawn 3 instead. Or just have 3 chances to spawn zombies over one chance. Is this possible? Not all fixes have to fix something "game-breaking". And if you see the description, it actually has much more functionality than just mobs spawning on trees. Oh man, it's a good thing you doubled back to write "LOL". For like two weeks I was wondering to myself "Is he laughing? He has to have at least chuckled." Sure enough, you ventured back to grace us with the knowledge that you were indeed laughing out loud. Quality comment my friend, quality comment. I hope no offense was taken: for the record I have used the mod and know what it's all about, but the name is pretty damn funny! When I add the following line to my backlist rules: "mob:creeper & chance:0.50"
What am I doing wrong? This is correct syntax, no?